Up your game this Mother’s Day and treat mom to these indulgent Irish Cream Scones! 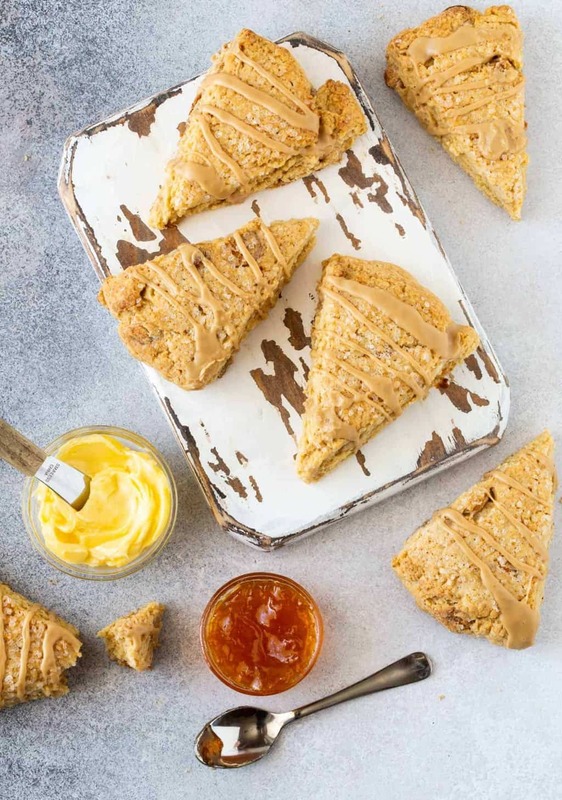 No one deserves more pampering than mom, and these rich, buttery Irish Cream Scones are the perfect way to show her how much you care this Mother’s Day. 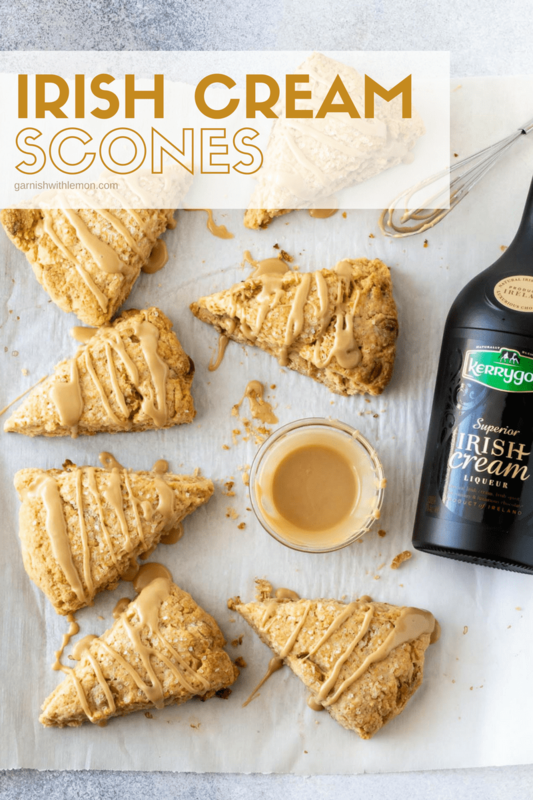 Scones often seem like a special occasion type of thing, but this Irish Cream Scones recipe is so easy, you might find yourself making them more often. Filled with decadent Kerrygold Irish Cream Liqueur (and a handful of caramel flavored baking chips, because, why not? ), these scones are a tender, flaky treat that is equally welcome at breakfast or as a mid-afternoon pick me up. Many scone recipes require you to cut in the butter by hand. Not this one. Using a food processor to make scones eliminates a lot of prep time (not to mention upper body strength!). It only takes a handful of pulses in the food processor to get just the right consistency of the flour-butter mixture. Simply mix with the wet ingredients, form and bake. Can you freeze unbaked scones? If I’m going through all the trouble of hauling out my food processor, I sometimes make a double batch of this recipe and freeze the second batch of unbaked Irish Cream Scones for later. I like to wrap my scones individually so I can pull one out whenever I get a scone craving, but you can also freeze the entire scored round of scones intact if you prefer. Either way, double wrap the scones so they are airtight and use the dough within one month of freezing. When you’re ready to bake, pop the frozen scones on a baking sheet, brush with cream and sprinkle with sugar. Add a few extra minutes to the specified baking time in the recipe to ensure they bake through. A food processor makes this recipe a breeze. Both Lisa and I have this Cuisinart model and love it. Don’t have a dough scraper? It makes quick work of cutting the scone dough into triangles. You’ll be amazed at how many other ways you can use it in the kitchen, too. Some scone recipes can be in-your-face sweet, but not these babies. An Irish Cream Liqueur glaze adds just the right amount of sweetness to these Irish Cream Scones. Every bite is the perfect balance of sugar and spice – just like mom. 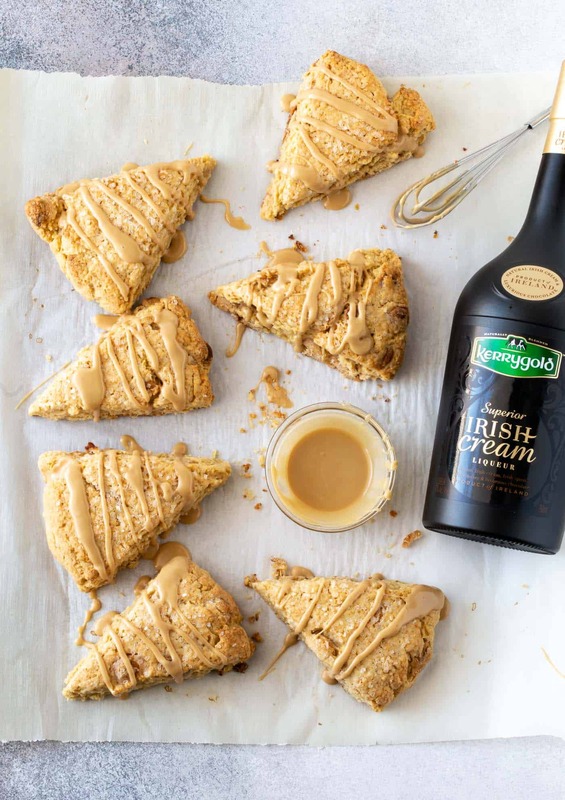 Love this Irish Cream Scone recipe? Give some of these other tasty scone recipes a try! Whisk together sour cream, vanilla, egg and liqueur in a small bowl. Set aside. Add flour, baking powder, sugar and salt to food processor. Pulse a few times to combine. Add butter to flour mixture in food processor and pulse until mixture resembles fine sand. Stir together flour mixture, wet ingredients and baking chips a large bowl until just combined. (Dough will be slightly crumbly but will come together when baked.) Turn dough out onto prepared baking sheet and gently form into an 8-inch round. Brush top of scone dough with heavy cream and sprinkle with coarse sugar. Use a sharp knife or dough scraper to cut round into 8 wedges. Pull scones apart slightly from one another. Bake for 20-23 minutes or until golden and baked through. Remove from pan and cool completely on rack. Whisk together powdered sugar, liqueur and vanilla until smooth. Drizzle evenly over scones.